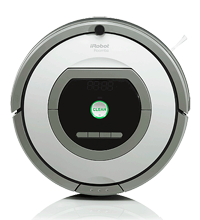 Recently, iRobot announced a new series of its consumer home vacuuming robots, the Roomba 700 Series. Along with this new series, they announced some new technologies. The flagship robot in the 700 Series is currently the Roomba 780. There are also two other 700 Series robots, the 760 and the 770. They come with some different features and accessories. The biggest difference between the three is probably that the 780 has a touchpad interface and comes with Virtual Lighthouses instead of Virtual Walls. For more details, I break down the 700 Series feature and accessory differences here. Don’t miss my two other 780 reviews: The first contracting and comparing it to a Mint Robot Cleaner. The second comparing it to a 500 Series Roomba. Here’s what you see when you open the box. So it comes with a self-charging dock, the battery charger, battery, extra filters, extra brushes, various brush cleaning tools, a remote control, and two virtual lighthouses. 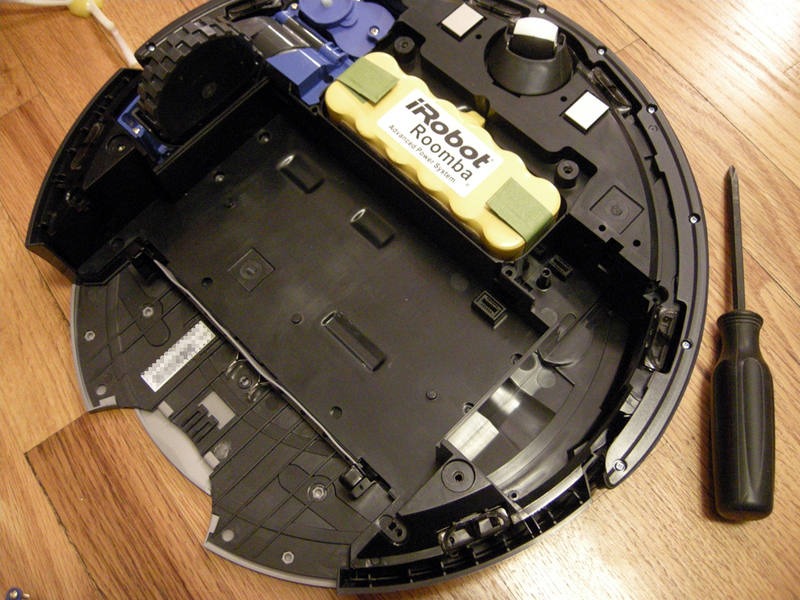 Besides the battery for the robot itself, iRobot does not include any other batteries. So you’ll need to get two double-A batteries for the remote, and also four C cell batteries for the lighthouses (each lighthouse needs 2 batteries). I’m one of those people who likes it when manufacturers care enough to include some alkaline batteries when they’re needed, so think it’s kind of lame that iRobot doesn’t include batteries for the accessories. 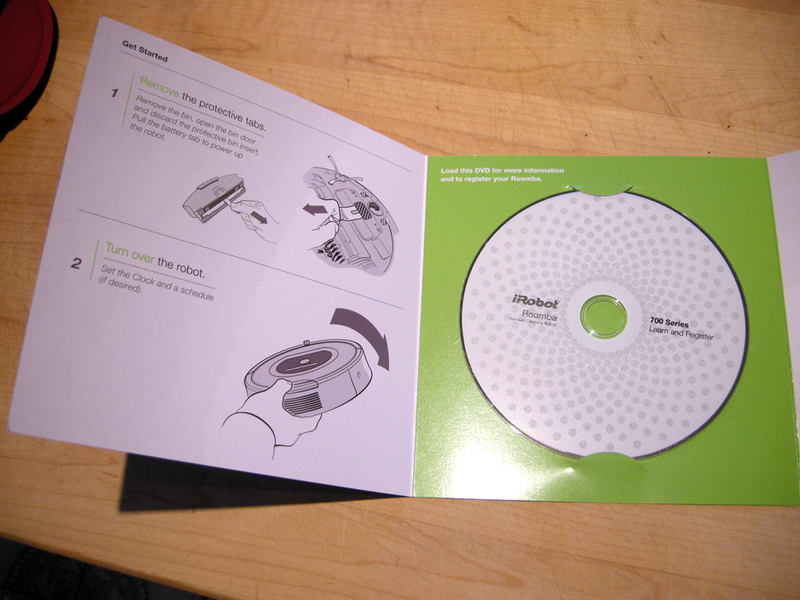 iRobot includes a quick start guide and a DVD. The quick start guide has four easy steps to get you vacuuming right away. I like quick start guides, and was glad iRobot included this. Basically, you take the robot, pull a tab out of the battery area, pull a piece of cardboard out of the dust bin, set the time on the Roomba, set up the charging home base, and then charge it up. iRobot is definitely into having you charge the robot. The DVD talks about it a lot. Speaking of the DVD, it has a bunch of movies about how to use the robot. The DVD is somewhat interactive. There is a section of instructional movies about cleaning with the Roomba. There is another area where the parts of the Roomba are identified. Besides the movies, there are applications for the PC and Mac on the DVD. These organize the documents available for the robot and include links to iRobot’s Customer Care area and where you can download User Manuals. Also included are the User Guide Manual (which covers the 700 series as one), Registration Data, Warranty Card, Important Safety Instructions, and a few other documents of interest. I’ve gotta say that I’m sure whether or not I like the fact that the User Manual does not come in printed format with the robot vacuum cleaner. On one hand, they’re saving trees. On the other hand, it’s inconvenient having to go to a computer and open up the manual any time you have a question. The manual is short and sweet, weighing in at 9 pages, including cover. Once you set up the charging base and put the robot on it, you’ll want to set the time, and also look at how to schedule the Roomba using the onboard scheduler. If you can set the time on an alarm clock, you’ll be able to set the time on the 780. It is as easy as pie. You basically turn the robot on, press clock, then use the minute, hour, and day buttons to set the time. Then press OK to finish. Scheduling works pretty much the same way, except you press Schedule to start. You can schedule one time a day each day of the week. One thing that’s great about Roombas is the technology. All of the major parts of a Roomba are modular, and can be replaced very easily. So the wheels come out as units, as does the side brush, the cleaning head, the roller, and the dust bin. Here is the 780 with the bottom taken off. You can see the pieces in purple which can be taken out. All this with a single phillips screwdriver. I think this is a really great feature! Of course, you wouldn’t do this unless you needed to fix something on your robot. 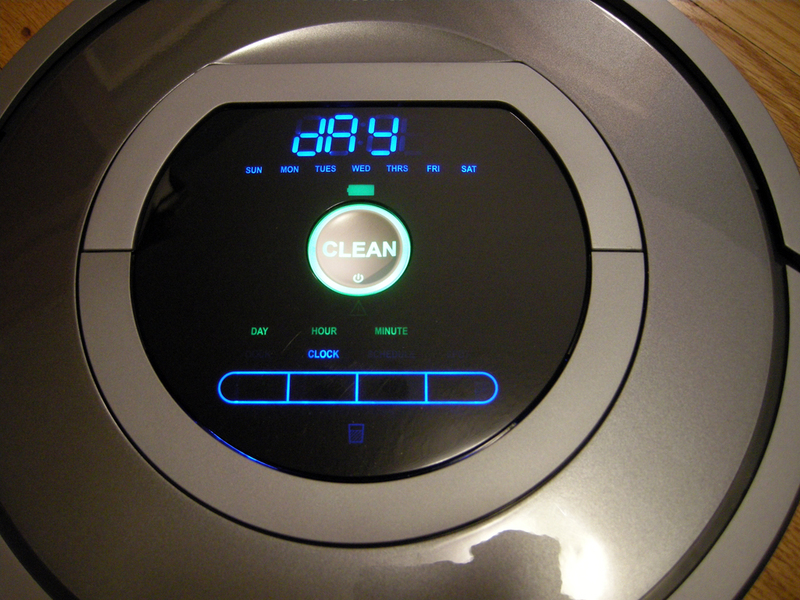 Here is one of the new pieces of technology in the 700 Series Roombas, the AeroVac Series 2 Bin. When compared to the dust bin from a 500 Series Roomba, you can see that the bin is pretty different. The filters are very different, there is more space for debris inside of the bin, and the bin itself is a lot easier to empty out. iRobot says that these new bins have more suction and that the debris gets distributed in the bin more evenly. The 700 Series Roombas all come with HEPA filters. HEPA filters are designed to capture very small particles so that common allergens don’t get thrown into the air by the vacuum. So they’re good filters for people with allergies. To empty the bin, you open a wide gate that closes off the bottom half of the bin, and then shake it out over a trash can. Then you need to knock out the two filters. These are colored yellow and have handy pull-tabs so that they’re easy to get out. Once removed, you knock those out over your trash can, and put them back in. The process is very easy. 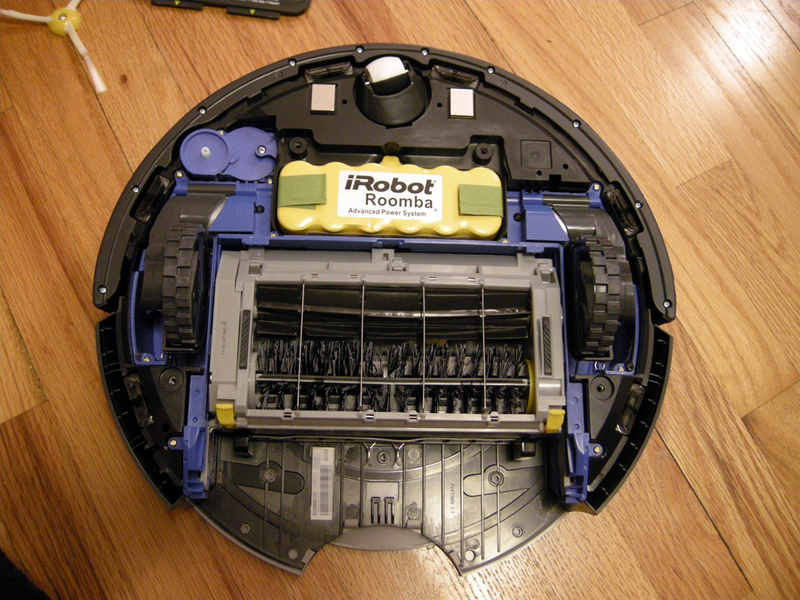 Besides the bin, iRobot has made some other changes under the hood, particularly with the cleaning head. Here are the brushes from a 500 Series Roomba (top) compared to the 700 Series (bottom). One of the things a Roomba owner learns is that the brushes have to be maintained, and one of the worst things about that is hair gets wrapped around many of the different parts of the brushes. One of the more obvious differences here is that the bearings on the 700 series are designed to not pick up as much hair. For one thing, on the left, the bearings on the 700 Series actually slip into something like a cowling, which keeps hair from wrapping around that end. On the 500 Series, these bearings are exposed and get all tangled up with hairs. Not as obvious, but also different, the bearings on the right side have been redesigned to make it so that there aren’t grooves for the hair to wrap themselves up in. 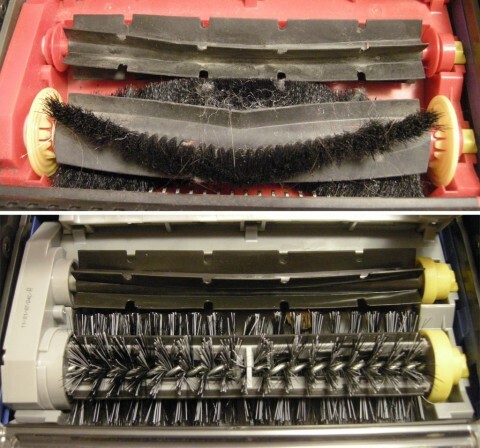 Besides these differences, iRobot claims that the 700 Series cleaning head is designed to pick up smaller particles better. So what else is different? The 700 series comes with a new improved Dirt Detect feature but in the 770 and 780 only. So when the robot detects an especially dirty area, it will spend some time concentrating on that area. The battery life is claimed to be 50% longer. There is a bin full indicator light (again only in the 770 and 780). All come with remotes. The 780 comes with a touchpad control. The touchpad control is very nice. I don’t really see what the big deal is, though. I mean, with the other two 700 Series the controls are basically the same but they have buttons instead of a slick interface. I guess maybe also the touch face makes it so you can just wipe off the top of the robot to clean it. The bin indicator light sounds like a great idea, but in practice maybe not so much. I found that after a good vacuuming session, the bin indicator sensors get dirty, and so the light won’t go off when you empty the bin. You end up having to empty the bin and then wipe the bin full sensors off. This makes me wonder if the sensors are really accurate. Maybe this is a good idea that is waiting for a better implementation. I like the fact that a remote is included with all of the 700 Series Roombas, although I do have to say that it has limited functionality. You can use the remote to start the robot, steer it, spot clean, and dock. So it’s more of a fun thing that is handy every once in a while, but isn’t something that everybody will really need. As advertised, the Roomba 780 does not eat the tassels on your oriental rug. Also, it can figure out if it is chewing on a power cord and spit it back out, which is pretty cool! It makes a funny noise when it does that. Mostly, though, when it comes to cords and cables, you’re going to want to move them out of the way or tuck them away as much as possible. 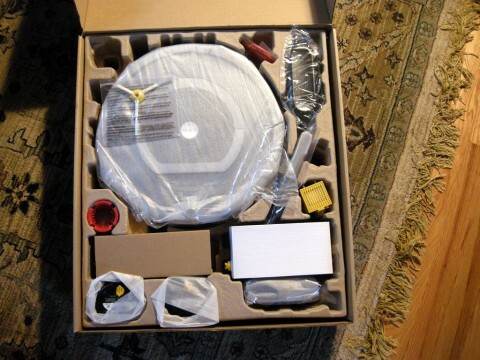 The unfortunate fact of the matter is that there is some room prep you need to do before running your robot vacuum, but it’s mostly prep you would have to do with a normal vacuum. So how does it clean? Great! It does an absolutely great job of cleaning floors, carpeting, and rugs. It picks up little things that my 500 Series Roomba doesn’t get, and seems especially better at pulling little fuzzies out of our area rug. 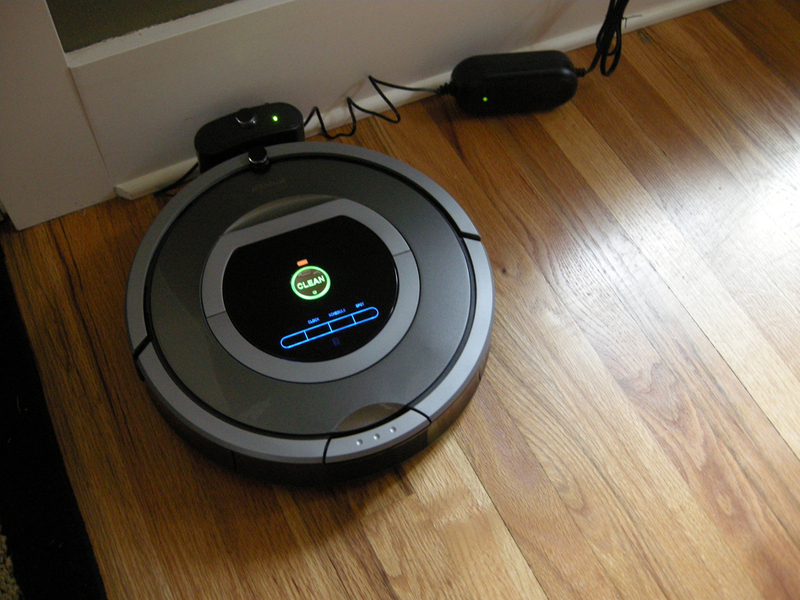 We tested the Roomba 780 with a Mint to see if one cleaned better than the other. See here for the full article: Roomba 780 vs Mint Cleaner. We found that they were pretty evenly stacked up, except that the Mint doesn’t do carpets. The Roomba is the winner for people with carpets, and also has more accessories and fun technology. Previous PostMint Robot Cleaner vs iRobot Roomba 780 – Robot Cleaner Showdown!Next PostiRobot Roomba 780 vs Roomba 535 Showdown! re 780: yes, but how does the multiple-room capabilty of the 780 work and is it really necessary to clean more than one room? With the 780, multi-room cleaning happens with the Lighthouses. The Lighthouses have an invisible IR light beam that comes out of them, like a flashlight beam. What happens is that you put a Lighthouse so that the beam coming out of it blocks a doorway. The Roomba will not cross the beam until it finishes the room it’s in. Once it finishes the room, it will cross the beam into the next room, and then it won’t cross again until it finishes that room. The reason you would want to use something like this is to make sure that both rooms get properly cleaned. The way Roombas clean rooms makes it so that they can’t really clean two rooms as completely as they can with the addition of a Lighthouse. When the Roomba has finished the second room, it will go back to the first room and (usually) find its way back to the home dock and charger. Does the 780 have any problems climbing onto thick carpets? Does it ever confuse carpets with walls? I can’t say for sure, but every Roomba I’ve used or reviewed can climb better than a person would expect. The hard limit will be the bumper. 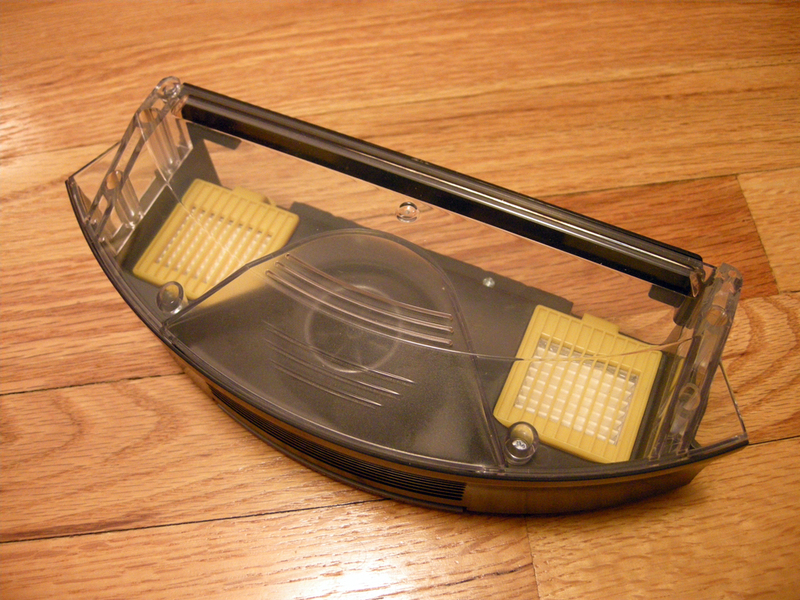 The bumper on the front of a Roomba will clear at least 3/4 inch, so it will “bounce” off something higher than that. Anything that doesn’t trigger the bumper, it will usually try to climb. Depending on how high your rug is, and what the transition is like, you may find that it can climb it most of the time, but might sometimes get stuck. Hope this helps! Note 1: A Roomba won’t climb onto a rug that is black or has a black border. It can’t see black things, and so it thinks that black areas are stairs or cliffs that it might fall off. As a result, it won’t go on them. Note 2: iRobot improved the suspension on Roombas starting with the 500 Series, so the 400 Series Roombas (and relatives) can’t climb as well. Is the Roomba 770 compatible with lighthouses? I know the 780 is the only one that comes with them, but if I bought lighthouses for the 770 separately, would it work with them? Great reviews! I have a 560, and my one big irritation with it is cleaning the dog hair out of the brush bearings. I thought about ordering the 700 series bearings to see if they fit, since they are covered. (Can’t do that with the other end, unfortunately. :-( ) Do you thing that would work? Thanks again for your research and writings! Thanks for the kind words. That’s an interesting idea, but the brushes and brush bearings for the 700 and 500 series cannot be swapped. It also turns out that the cleaning head modules, although they do physically fit when swapped between the two models, don’t work the same with the dust bins between the two. The dust bins are not interchangeable, so you’re pretty much stuck with the 500 Series bearings and cleaning head. I’m the happy owner of a 780 roomba. You have convinced me. I heard about Roomba years ago and thought BAA HUMBUG. But I just saw an add for the 560 at Petco and started reading about the different models. Then I discovered the newer models. I may have to wait a month to purchase the 780, but this will be my next aquisition. I just wonder how the 9 kitties will react. Almost all cats don’t know what to do about them at first. But I think most get used to them. Good luck! I bought my 780 a month ago using it every 2 days. I was very happy with my 780, until now! I’m sure it’ll get resolved quickly. Good luck! Does the Roomba 700 series have the same problem with dark colours as the 500 series did? If you’re referring to how the cliff sensors will confuse a Roomba on a black carpet, the answer is yes. Does the roomba 780 require 220 wiring? Nope. I think that 220 is available for countries that run at 220, but it isn’t necessary.